We are not static. We are not just standing still. We see ourselves: growing, going forward, whole, healed and changing for the better on good days. On the not so good, we feel like we are one step forward, 2 steps back, like we’ve lost footing, we’re not where we should be, want to be, like changes we didn’t want have been imposed on us, upsetting the settled lives we had planned so carefully. We judge ourselves everyday, don’t we? 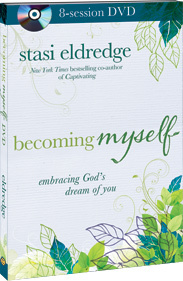 David C. Cook just released the first video session of Staci Eldredge’s Becoming Myself series. In it, she says we long for change in us because we are meant to have it. She says our very dissatisfaction with our weaknesses reminds us that they are not our destiny and that God promises to transform us – in ever-increasing glory. Hi there! I’m part of the team at Ransomed Heart (with Stasi Eldredge). I just came across your blog and was thrilled that the first session of her new DVD series resonated with you. We’d love to send you a DVD of the complete series. If you’re interested, shoot me an email! YAY Jeanie!!!! Thankful that we are walking through this crazy life together as friends, seeing the veil being raised, inch by inch, to reveal the beauties He created us to be!! She is awesome! Thanks for posting this.